Crowd-pleasing catering for parties, meetings, weddings and more. 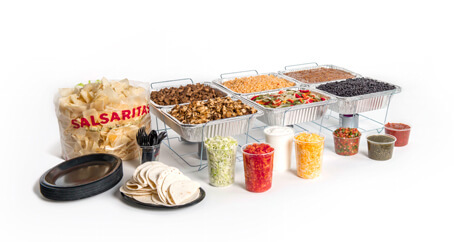 Everyone loves catering from Salsarita’s Fresh Mexican Grill. Our Taco and Fajita bars allow guests to choose exactly what they want and make it just the way they like it. Delivered. Set up. Delicious. That’s Salsarita’s catering. Please select a location below to see menu, pricing, and order form. Please contact the restaurant directly for pricing information. Includes cups, ice, lemons and sweeteners. Satisfy every sweet tooth with our delicious desserts. Catering orders are not confirmed until contacted by the restaurant after submitting an inquiry. This iframe contains the logic required to handle Ajax powered Gravity Forms. Please call the restaurant for same day catering order inquiries. After submitting the form, you will be contacted to confirm your order. Orders are not confirmed until finalized with a Salsarita’s representative. This information will only be used to contact you about a catering inquiry. Delivery charges may apply. Pricing varies by location. 24 hours’ notice required for cancellations or fee may apply.